Imagine sweet dough made from melted mozzarella and semolina - yet you cannot tell what deliciousness this is - with a creamy mascarpone filling! Aahh! My mums favourite dessert - the yummy halawet el jibn! This recipe was given to me by the amazing Jinan, who was taught this by her mother in law! The blessed month of Ramadan is around the corner! May it be a month of great blessings and upliftment to all. Below I have shared some recipe ideas to help you think of what to make during this holy month, something quite easy (to reserve your energy) and not so time consuming (to utilise your time for other things). A quick, yet filling and scrumptious breakfast/lunch. The sumac gives this tangy goodness to the omelette. You could change what you add according to your liking, but this is how I made it - and it was super delicious!! If you have had kunafa before, you will understand why I say this is one of the most popular and delicious desserts out there! I have previously made kunafa with qashta (cream), which is just as yummy. But there is something about stretchy sweet cheese with a crispy pastry, drenched in sugar syrup that is just tooooo good to be true! I had the great opportunity to learn how to make a few traditional dishes with my friends mother, a great cook who has been making delicious dishes for years! This is one of the dishes she taught me and I was so excited to recreate it and share it with you. It is very straight forward and so yummy! This is a straight forward no bake cheesecake topped with a delicious strawberry coulis. You can make this in advance ready to enjoy every bite! My family thought it was a cheesecake I had bought, that is how delicious it was. Highly recommend you give this a try! A deliciously satisfying yet simple dessert to make. This Lebanese pudding can be eaten hot or cold, which makes it perfect to make as a last minute pudding for guests or ahead of time for something that looks and tastes complex, but is so easy to prepare. 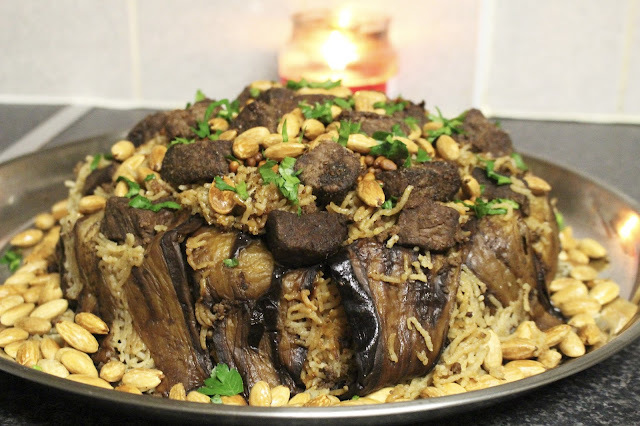 There are many variations to maqluba, but no matter what, this is one of my favourite rice dishes! Simple in its ingredients but soooo delicious! Maqluba basically means upside down...and that is exactly what you do, turn the rice dish upside down. Oh so good! There are so many ways to make a chicken curry, and it differs according to preference. This time, I really felt like a saucy curry, that is probably a bad way to describe it...but I am not quite sure how best to describe the type of curry I wanted. But here it goes..
Who doesn't love pasta? This Egyptian pasta dish has a layer of pasta mixed with deliciously flavoured minced meat, topped with creamy bechamel sauce and a crispy breadcrumb layer to top it off. Straight forward and so satisfying. I wanted to make a cookie that is super delicious, with the softness of a Subway style cookie. This really was so so good - took them to work and they literally flew from the container! Definitely something you should try for yourself. Oh, how hard it was for me to come up with a name for this dish! It was basically a sort of imaginary theory in my head, which I made up along the way - only to discover an absolutely delicious dish!! It is so yummy that my family have asked me to make it again for my sister to taste when she comes over. It is like a food fusion, arab style rice with an almost chicken tikka flavoured chicken. You will love it! I recently purchased a pressure cooker, for my mother, lol but somehow I feel I am using it more than she is! This dish was made using the pressure cooker, but you can still make it without it. It just means you will adjust the cooking time of the chicken for around 20-30 mins, or until it cooks through. I have made a few burger recipes before, simply type 'burger' in the search bar, but I have not shared my way of making minced chicken burgers. You are in for a treat! The flavour of these burgers is so tasty, you will love it! 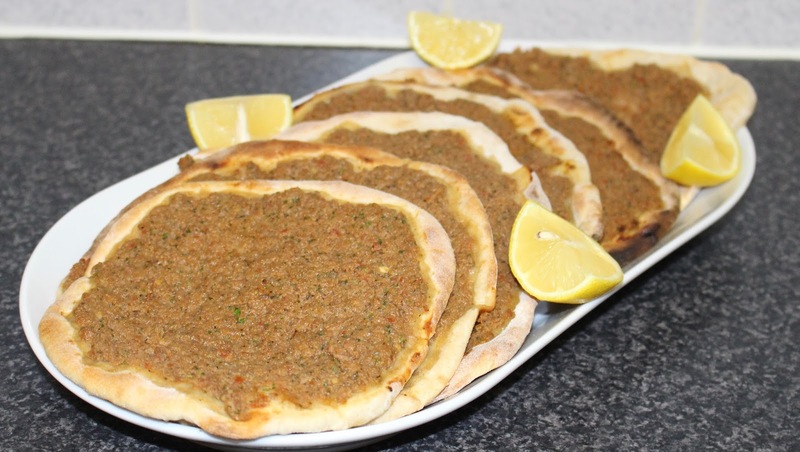 Sfiha - the Lebanese version of a thin crust, soft, meat pizza - super super delicious, and popular in countries like Lebanon, Syria and Iraq. Eaten as a breakfast, lunch or even as a side at dinner! This is such a versatile recipe, you could use it to marinate chicken for any type of dish. I decided to make it into a sandwich wrap, you could put it over rice, as a side with bread and dips, over a salad, bbq on skewers ... the options are vast! So use this recipe to help you enjoy it in whatever way you like! I was asked by the Rabata Friends, Fun and Faith camp to do a nosaibasfood cooking class. At first I was nervous as to what to do with these 13-18 year old girls, without any cooking hobs for the class. I decided to get the girls to make the tomato, olive and basil pasta from my blog, working in teams, with a blind-fold taste test at the end to determine the winner. Alhamdulilah it was a great success! Smiling faces is what I want to see - and that is exactly how the girls were during the class, alhamdulilah :). A super refreshing drink, which can be made according to the taste you prefer. The unique taste of this mojito comes from the grenadine syrup, which really elevates the flavour. Simple and so easy to make. 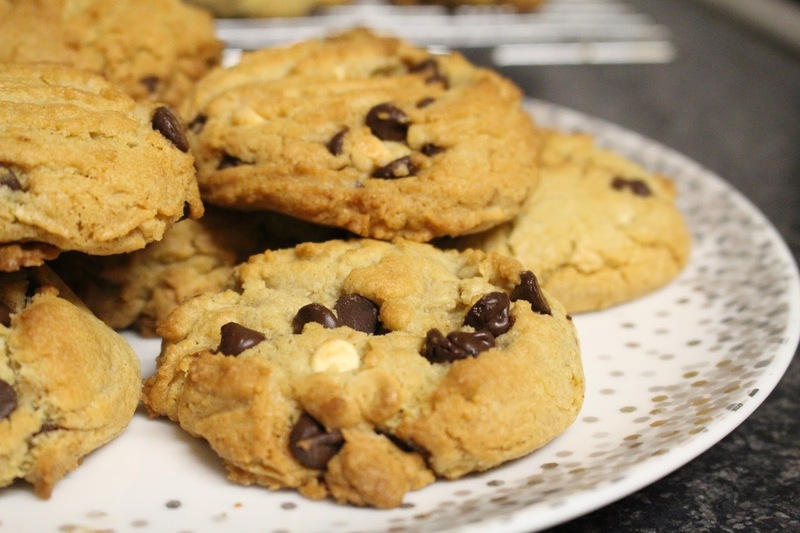 For some soft and chewy delicious chocolate chip cookies, which hold their shape and are so easy to make - this is the perfect recipe for you. 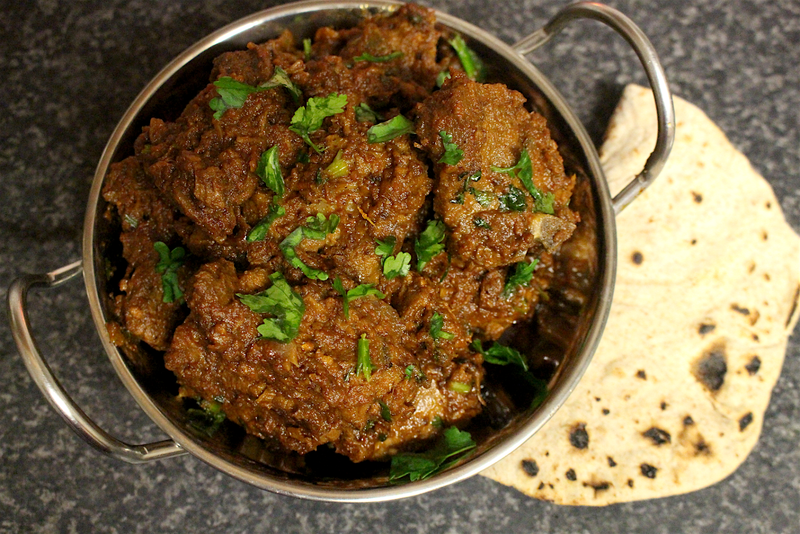 A perfect accompaniment to a hot curry or a rice dish. Its cooling deliciousness is so easy and quick to put together. I made it along with my bagara rice dish. There is so much room for creativity when it comes to raita, so enjoy this recipe and expand upon it as you wish. For a simple and quick vegetarian rice, that is the perfect accompaniment to currys, sauces or simply on its own, this is the dish for you! Bagara rice is most popular at occasions in the Hyderabad region, yet is the perfect alternative for biryani, pilau or plain rice. 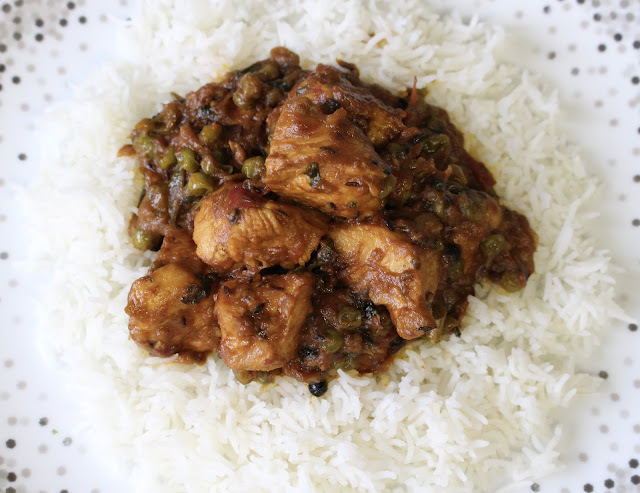 For a light, fragrant and absolutely delicious rice dish - this is the one! It is so straight forward to make and a wow-zer for whoever tries it! Give it a go to see for yourself. I really love pasta with béchamel, it is light, creamy, cheesy and oh so yummy! I hope you enjoy making this simple recipe, and enjoy even more digging into it! Ramadan Mubarak to you all! It is the blessed month of Ramadan, alhamdulilah for being gifted this great blessing! (to reserve your energy) and not so time consuming (to utilise your time for other things). Sometimes you run out of ways to make chicken, something easy, quick and tasty...and this is exactly what this recipe is! The tamarind goes sooo well with the chicken, it really is finger-lickingly good! I absolutely love biryani, who doesn't? I have made boneless chicken biryani, chicken biryani and mutton biryani before, all are delicious recipes to try. If you want something that has the biryani theme to it, but without the spice, with depth of flavour and is straightforward to make, then this arabic style chicken biryani is perfect for you! This Lebanese yakhni - or what you may call a stew - uses minimal ingredients, yet it is so delicious and straightforward to make! If you are a lover of cauliflower, you are in for a treat! I absolutely love this super easy, absolutely delicious dish that you can put together so simply, then let the oven do the rest of the work. It was literally finger licking-ly good! You have to give it a go to understand what I mean! If you are wondering what to cook, something super simple, super quick and using minimal ingredients you already have on hand - then you are missing out if you don't make this! It is so yummy with minimal effort. This is the perfect soup to make from the basic ingredients you already have on hand. It is quick and easy to make, yet absolutely delicious in taste. It was one of those moments when you crave a delicious, juicy, flavourful salad - that satisfies both tangy and sweet flavours. This salad does all this, the sharpness from the vinegar is met by the sweetness of the dried cranberries, the juiciness from the pomegranate, the saltiness of the feta and the crunchiness of the pine nuts. It is a perfect quick salad, with so many ways to personalise it to your liking. When you are missing Malaysia, a delicious soto ayam can really help bring back wonderful memories. 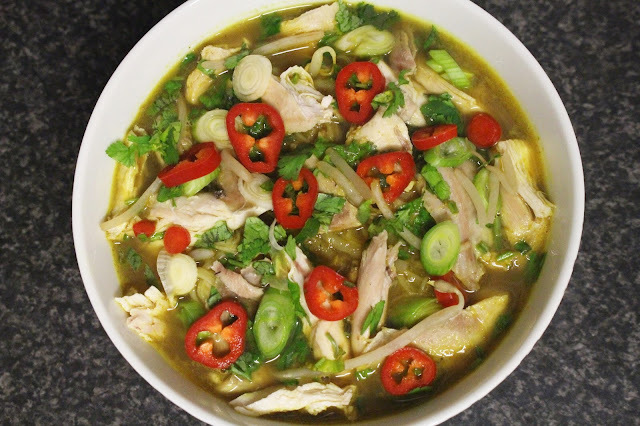 This soup was one of our favourites with its depth of flavour and deliciousness. I read through a few recipes and took the best of all the different ways of making this soup. Obviously this cannot compare to the real deal in Malaysia, but it definitely comes very close to it. So yes, I have disappeared for a while...this time with a legitimate excuse! Alhamdulilah I spent two weeks with the amazing Anse Tamara Gray in Malaysia, helping establish a much needed organisation which helps empower women by women. It was all about promoting positive cultural change, and helping to revive the female voice in scholarship (visit: www.rabata.org). So besides the uplifting and life changing experience in the beautiful land of Malaysia, as well as the amazing hearts you find amongst the people, the food is just incredible! Below are a few of the foods on what felt like a trip that could have lasted even longer! Imagine a light and fluffy pancake, then imagine it being filled with warm and gooey nutella - that is exactly what this pancake is! Absolutely delicious mashAllah! This is perfect for those who want an easy, delicious and hassle free dish - only one pot to wash up, and who doesn't love having less mess to clear up? The balance on this pasta dish is just perfect, tangy yet sweet - hope you give it a go and let me know what you think. 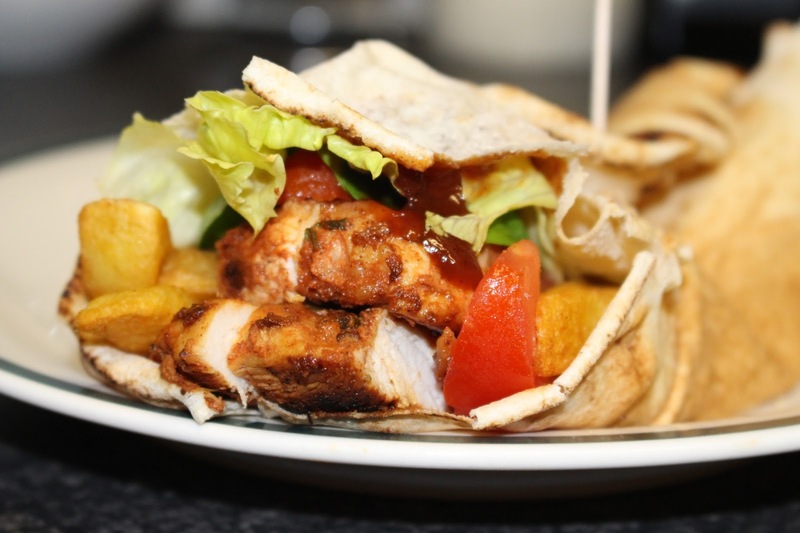 If I was to begin with expressing just how delicious this Middle Eastern starter is, it would not do it justice! It is light yet so delicious - you will have to go back for more until the whole thing is finished. The way I have made it today is thanks to my Syrian friend, who made it once and I just fell in love with how good it tasted! So I obviously enquired how it was made, and thanks to her for sharing the method with me. It is something I highly recommend you try - simple, quick and soo tasty! I have been craving some good old home made biryani for so long! I wanted to make something easy, yet super delicious. Who doesn't love some good old biryani??? It is my absolute favourite!! This is the perfect soup for when it is cold and gloomy outside, something that is full of flavour yet also full of benefits to help keep you well, or help you get well soon! The ginger, garlic, turmeric, cumin are just some of the ingredients in this soup to act as the medicine for that cloudy day. A super delicious soup, perfectly balanced! I hope you give it a go and enjoy it as much as me and my family did. A lot of people don't like the idea of salmon, or have never found it delicious. For this reason I think you will love this recipe, as the marinade is just so yummy, and the salmon comes out lovely and perfect. Best of all, it is so simple and easy to make, minimal effort yet amazing outcome. I will be putting the blog into some capable professional hands to give it a touch up that the user (i.e. YOU) wants. I want it to be as user friendly and easy to navigate as possible, making finding recipes and scrolling through the website as swift as possible. For this, I would love to hear your opinion about what you like in the current blog (so we can make sure to keep it) and what you would ideally like to have on here, what improvements you wish to see...your general opinion would be really useful! 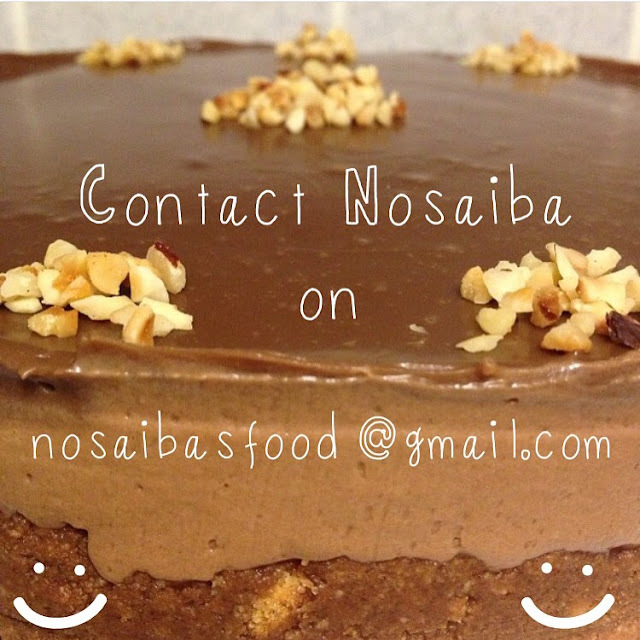 So please leave your comment, or email me on nosaibasfood@gmail.com. Thank you in advance and I look forward to the new and updated website to come inshAllah! This garlic chicken is just super tasty, the chicken is deliciously flavoured, and the accompaniment of the buttery flavoursome sautéed potatoes is just perfect! Another one from the catering event. This is easy, filling and flavoursome salad - and not only that, it is healthy and the longer you leave it in the fridge, the more flavour it has! So it is perfect to make in advance and take it with you for lunch or dinner. 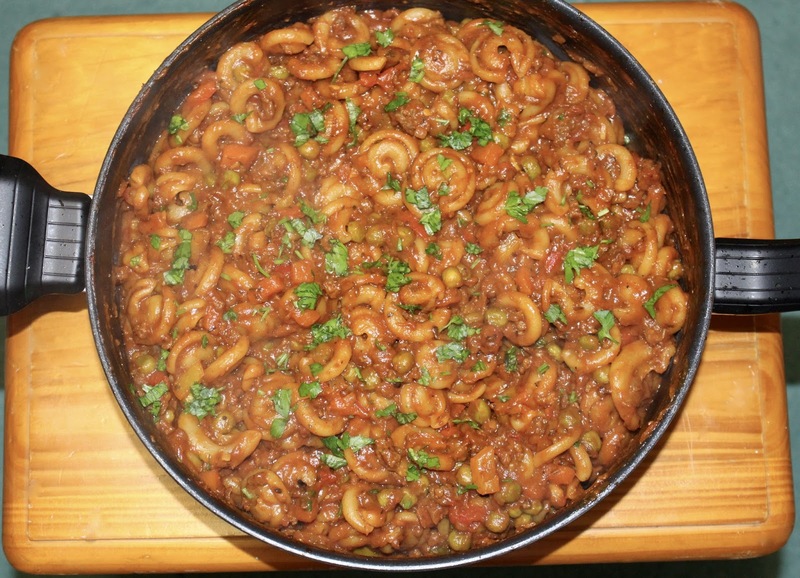 This has got to be my favourite pasta salad so far, its light yet filling, and has such good flavour to it mashAllah!! This is another one on the menu from the catering event. It is really straight forward to make, and once made can be kept in the fridge ready for your next days lunch. This is another recipe that I made for the catering event - and I have to tell you, the flavour on the chicken alongside the dressing on the salad lifts this to another level. It is something you can prepare separately and mix it when you are ready to eat and enjoy!